About the Author: Danielle Paige is the author of Stealing Snow and its prequel novellas Before the Snow and Queen Rising, as well as the New York Times best-selling Dorothy Must Die series: Dorothy Must Die, The Wicked Will Rise, Yellow Brick War, and seven prequel novellas. Before turning to young adult literature, she worked in the television industry, where she received a Writers Guild of America Award and was nominated for several Daytime Emmys. She is a graduate of Columbia University and currently lives in New York City. My Review: This is kind of a hard book to review for me. I mean I didn't finish it for one thing but I did read the ending. The book started out very well but by 100 pages it just felt very stagnant and the story started to slow down a lot. I really just kind of wished that the author would have cut out about 100 or so pages so. I think that would have speeded the story up just a little as it really started to drag. As for the characters I really loved Snow. The twist that I found out after reading the ending was great too. Because I think I really figured that out before I even read the ending but it was still a great twist. The rest of the side characters other than like the River Witch were all pretty one-sided. I kind of get that for the other kids in the institution since Snow doesn't really spend a lot of time there. We really don't need their back story. I think another issue with this one was that it was world-building light. We get a few things about this world but nothing really dramatic which just left the world in a state of ice and cold. Which I mean it has been winter for some odd 15 years. But I would have liked a little more backstory to this world. 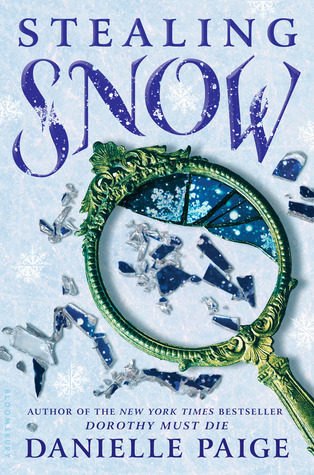 I think this could have been down with a prologue about Snow's mom leaving this world with her. It would have given us some major backstory to this world and really would have drawn you into the story. I think this one just wasn't that good to tell you the truth. Although it was pretty acceptable it's not something that I will try again. I really wanted to love this one as I loved the Dorothy Must Die series by this author. But this retelling of the Snow Queen just fell way flat for me. Make sure to Join us Dec. 16th at 2pm at the Winter Haven, FL Panera Bread to discuss the December chlice!! You can check out updates on Instagram, Twitter, and Facebook under @ShelfieBookClub!